Welcome to the second edition of Glamour & Grammar, the blog series in which I address grammatical failures in pop culture. Is it okay to correct the grammar of royalty? Yes, just not to any royal faces. Is it okay if the grammatical errors in question were made in a letter to a young cancer patient? No, probably not. 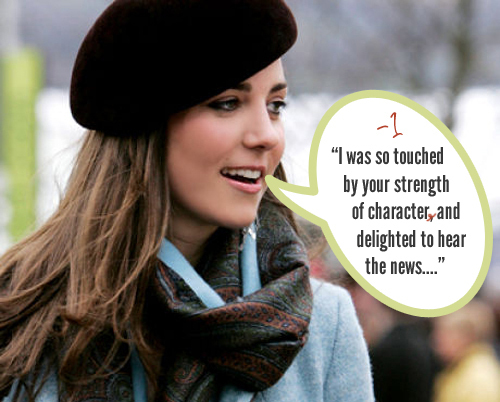 But if it were okay, then I'd point out that Kate Middleton's been having some comma trouble lately. 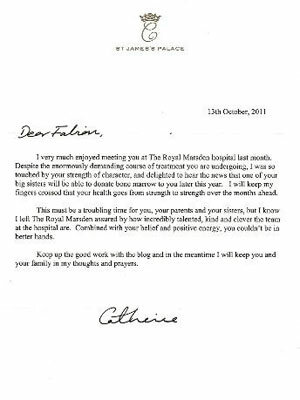 I would let you know that the comma trouble surfaced in a note Kate wrote to a little boy whom she met in a children's cancer unit. I might even post the note on my blog and turn the problem areas purple. I was so touched by your strength of character, and delighted to hear the news that one of your big sisters will be able to donate bone marrow to you later this year. I will keep my fingers crossed that your health goes from strength to strength over the months ahead. This must be a troubling time for you, your parents and your sisters, but I know I left The Royal Marsden assured by how incredibly talented, kind and clever the team at the hospital are. Combined with your belief and positive energy, you couldn't be in better hands. Keep up the good work with the blog and in the meantime I will keep you and your family in my thoughts and prayers. I would explain that "and" provides sufficient separation for "touched" and "delighted" in the first highlighted sentence. The comma between those words is unnecessary.I would also explain that a comma is needed in the second highlighted sentence. A measly "and" isn't strong enough to carry an independent clause on each side. Like any coordinating conjunction, "and" needs a sidekick comma if it hopes to balance a compound sentence. "I was so touched by your strength of character and delighted to hear the news...."
"Keep up the good work with the blog, and in the meantime I will keep...."
At this point I would probably feel like a horrible person for critiquing a letter to a cancer patient. I might even decide to give Kate points back for being a classy lady. There is, of course, the possibility that someone other than Kate Middleton penned typed this letter. If England is anything like America, someone other than Kate Middleton probably typed this letter. Clearly you are in need of a public relations practitioner who handles punctuation aptly. Look no further. I have a degree in public relations and 15% of a degree in journalism, and I know how to place a comma. You can reach/hire me via the contact link at the top of this blog.